of flattened circular form moulded in low relief on both sides with a wide peach-shaped panel decorated with bats flying around leafy peach sprays bearing ripe fruit, surrounded by formal floral scroll repeated in a collar around the cylindrical neck below a border of upright ruyi-head motifs and a narrow band of lingzhi meander under the flared mouth, the narrow sides also painted with lingzhi meander and joined to the neck by rounded strap handles with moulded ruyi-head terminals, resting on a low oblong foot decorated with classic scroll, the recessed base inscribed with the six character seal mark of Qianlong. 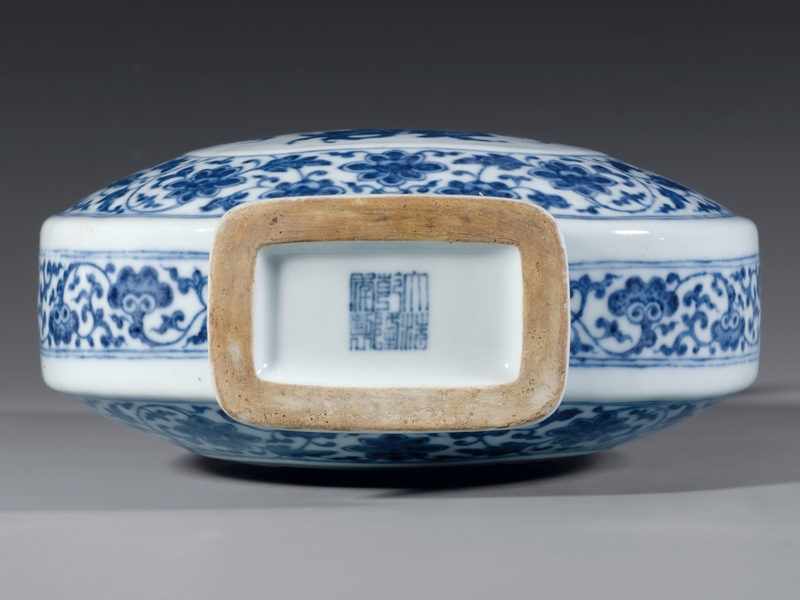 Compare the very similar Qianlong marked blue and white moonflask in the Palace Museum, Beijing, illustrated in Gugong bowuyuan cang gutao ziliao xuancui (Selection of Study Materials of Ancient Ceramics in the Palace Museum Collection), Vol. II, Beijing, 2005, p. 210, no. 186. 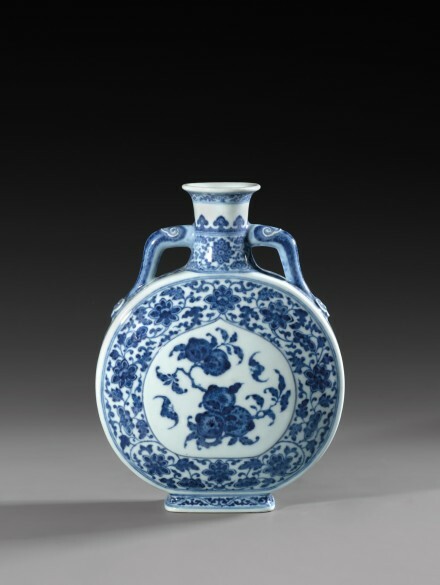 Compare also the Qianlong marked blue and white moonflask in the Indianapolis Museum of Art, illustrated by Mino and Robinson, Beauty and Tranquility: The Eli Lilly Collection of Chinese Art, Indianapolis, 1983, pp. 284-285, pl. 116.